Low rated New york City nursing homes accumulate complaints of abuse and neglect and little is being done to improve the situation. Unlike other states, New York does not have a mandated minimum staff ratio or a minimum amount of hours that nursing staff is required to devote to nursing home residents. 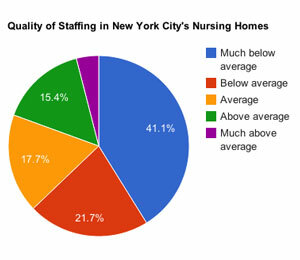 These staffing deficiencies can lead to horrific situations of nursing home abuse and neglect. The Gotham Gazette recently published five articles that looked in depth at the inspection reports, complaints and court reports for five of the lowest rated nursing homes in the city. The Mosholu Parkway Nursing and Rehabilitation Center is so understaffed that it threatens the health and well-being of its residents. A few years ago, a resident who was supposed to be supervised when he smoked put his wheelchair bed sheet on fire and was engulfed by flames for 4 minutes until the fire was extinguished. He died from his injuries after a year of pain and suffering. Physical abuse of residents by other residents is also common at this nursing home where residents with violent behavior are not properly monitored and managed. Inspections in recent years show serious deficiencies in healthcare as well as 12% of residents suffering from bedsores, double the national average. The place is badly managed and disorganized. The Mary Manning Walsh nursing home on the Upper East Side of Manhattan a well managed establishment in the past went downhill. According to a visitor the place is dirty and run down and the staff is not caring. The nursing home is one of the lowest rated nursing home in Manhattan according to the Center for Medicare and Medicaid Services(CMS). It is one of only two nursing homes in Manhattan that has only one star out of five in the health inspection category. Bedsores, hot water hazards, medication errors and failure to report them as well as failure to store and cook food in a safe way are among the recent complaints. Inspection reports also show a higher than average number of residents with symptoms of depression. Marcus Garvey Residential Rehab Pavilion in Brooklyn is now operated by new owners but remains one of the worst nursing homes in the country. The facility was placed several times on the SFF watchlist and problems of substandard care are persisting. 40% of patients are receiving antipsychotic drugs, twice the national average. Two thirds of the residents display symptoms of severe depression, that’s 11 times the national average. Failure to properly administer medication, failure to provide proper dental services, failure to address critical and aberrant lab results and failure to properly assess resident health status were issues recently reported. These problems are troubling signs of serious neglect at this Brooklyn nursing home. The extremely understaffed Hopkins Center for Rehabilitation and Healthcare is rated a one star facility by the CMS. A registered nurse spends 26 minutes a day with a resident on average compared to a 42 minute state average. An aid nurse who helps feed, dress and bath residents spends an average 51 minutes a day with a resident compared to two hours and 22 minutes, the state average. 14% of residents are suffering from bedsores and 23.7% long term residents are depressed. New York State regulations do not have specific standards with regard to adequate staffing. the Hopkins Center for Rehabilitation and Healthcare clearly takes advantage of this loophole and neglects its residents by not providing them with necessary care. Bishop Henry Hucles Nursing Home in Bed-Stuy, Brooklyn, NY, is also very understaffed, neglecting to provide sufficient care to many of its long term care residents who suffer from Alzheimers and dementia. Residents are dressed in tattered clothing, the food is horrible and health violations are more than double the state average. A resident said that he gave his prosthetic leg to an aide while being seated in a wheelchair and the aid never returned it. The staff is clearly overwhelmed: in 2011 new management reduced the staff to 3 certified nurse aids per floor of 40 residents.